- Rounds should be set to 9, armor damage on and falling damage on. - An admin has to be present for games. - Failure to provide demos upon request will result in an automatic FF. 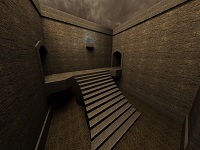 - Map List is still to be determined, should be posted in a few days. - Games should be played in a timely manner, and be fair for both teams. - Server will be tx based as it is a central point for the US. - Mumble is not required for games, but is encouraged as it is good for communication.